An internally displaced woman sits outside a tent in Idlib province, Syria, July 30, 2018. | Photo: Reuters | Photo from teleSur. 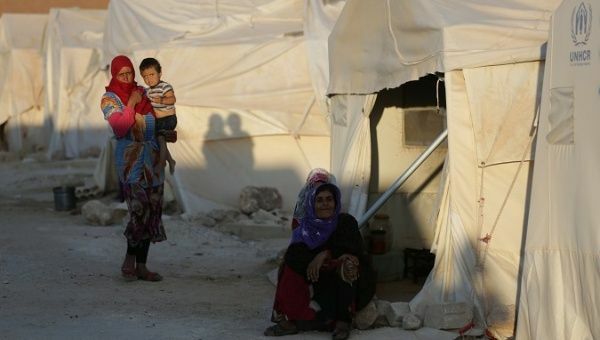 8 August 2018 (teleSUR)* – Seven years of relentless conflict in Syria have wreaked destruction that the United Nations said Wednesday [8 August 2018] has cost the country close to US$400 billion. The figure was released after a two-day meeting of more than 50 Syrian and international experts in neighboring Lebanon, hosted by the UN’s Economic and Social Commission for Western Asia (ESCWA). ESCWA said the “volume of destruction in physical capital and its sectoral distribution” had been estimated at more than US$388 billion. On the same day, Jordan warned that a severe financial shortfall facing a United Nations agency that helps Palestinian refugees could have a “catastrophic” impact on the lives of millions of refugees in the region. U.S. President Donald Trump withheld the aidafter questioning its value and saying Washington would only provide more assistance if the Palestinians agreed to renew peace talks with Israel.